Mochi, a delicious whole grain food, is made from a glutinous, high-protein variety of rice called sweet rice. 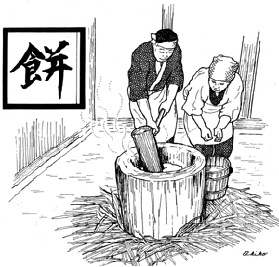 The sweet rice is soaked, steamed, and pounded; then it is allowed to dry until it is firm enough to slice. Late in December, traditional Japanese villages resound with the rhythmic pounding of sweet rice as families prepare mochi for the festive New Year's meal. A large, smooth bowl made from a hollowed-out log carved generations before and a heavy wooden mallet are set in place as the annual mochi-pounding ritual begins. It is usually the grandmother who begins the tradition by placing steamed rice into the hollowed log. After each resonant stroke of the grandfather's mallet, the grandmother turns the rice. They work together quickly and rhythmically. Grandmother bobs in, turns the mound, then leans aside each time the mallet crashes down, releasing billows of steam from the hot rice. After being pounded into a homogenous mass, the mochi is formed into small, flat cakes or balls known as o-hagi. Coated with sesame seeds or ground nuts, o-hagi is a children's favorite. The remaining mochi is allowed to dry, then it is stored in a cold place or refrigerated for later use.